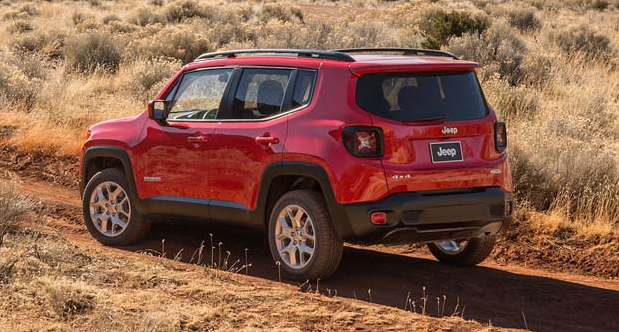 At Davis Dodge, we offer the Consumer's Digest's "Best Buy", the Jeep Renegade. 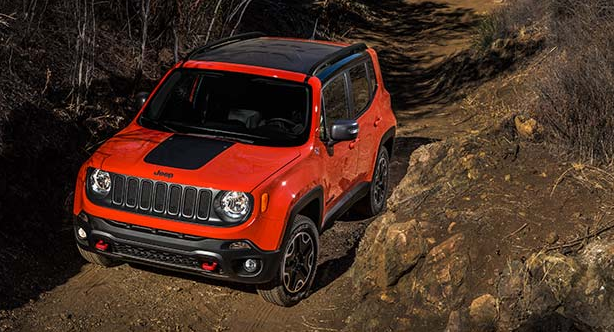 The Jeep Renegade comes in 3 of options, the Sport, North, Trailhawk and Limited. 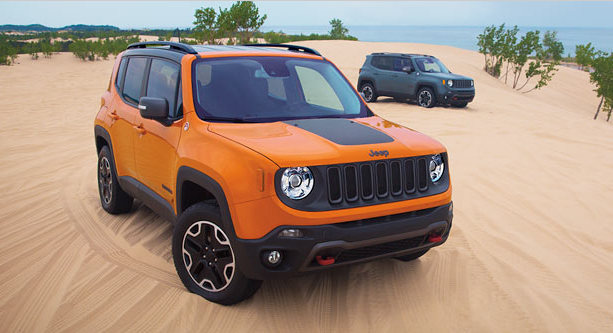 Since its debut last year, the Jeep® Renegade continues to lead the way as Canada's most capable small SUV ever. 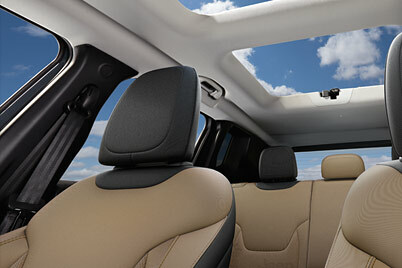 With 2 available 4x4 systems and Best-in-Class 4x4 capability, adventure is always within view. Talk with one of our representatives today, and learn why vehicle buyers come from Calgary, Lethbridge and Pincher Creek for a shopping experience at Davis Dodge. 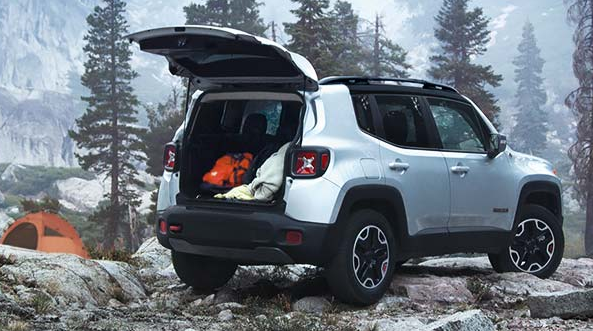 The Renegade can fit a 5-foot ladder inside thanks to a standard fold-forward front passenger seat. A 60/40 split-folding rear seat also comes standard. 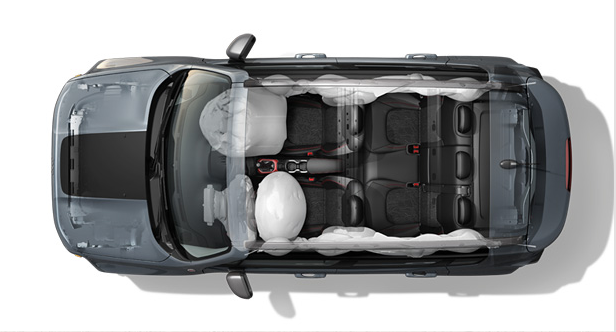 For added versatility, a 40/20/40-split rear seat with cargo pass-through is available. 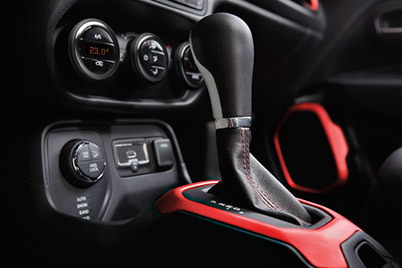 The Jeep Renegade comes in 7 interior colour combinations to suit your adventurous personality. Choose standard premium cloth or available leather-faced seats, all in two-tone colour schemes. Choose from adventurous accent colours like Red, Moroccan Sun and Ski Grey to personalize the two-tone interiors offered in the Jeep® Renegade. Combat the cold with available heated front seats and leather-wrapped steering wheel - a luxury normally found only on more expensive vehicles. The available Class-Exclusive My SkyTM Open Air Roof System43 offers either a manual removable, or power tilt/slide removable dual-panel roof. When detached, the lightweight and durable panels stow neatly in the height-adjustable rear cargo area for a quick transition to sky views. 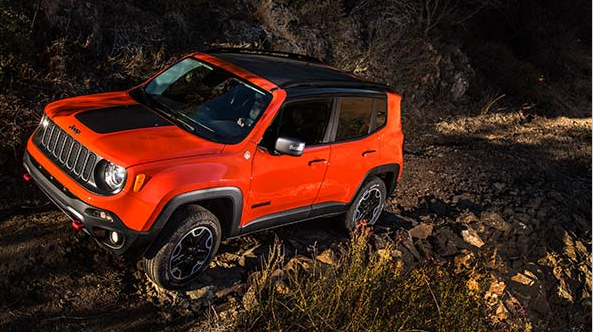 Though modern and distinguished, the Renegade stays true to its Jeep® heritage with large circular headlamps tucked under the lip of the hood, trapezoidal wheel arches and wide fenders. The short and bold overhangs also contribute to Best-in-Class ground clearance. The rugged shape utilizes honed surfacing and aero-enhancing applications. This delivers exceptional aerodynamics for improved fuel economy and a quieter ride. The short overhangs contribute to Best-in-Class approach and departure angles, while also creating a bold presence front to back. Explore further with impressive 30.5 and 34.3 degree approach and departure angles, and a 25.7 degree breakover angle with the Trail Rated® Trailhawk®. 7.5 L/100 km (38 mpg) highway. 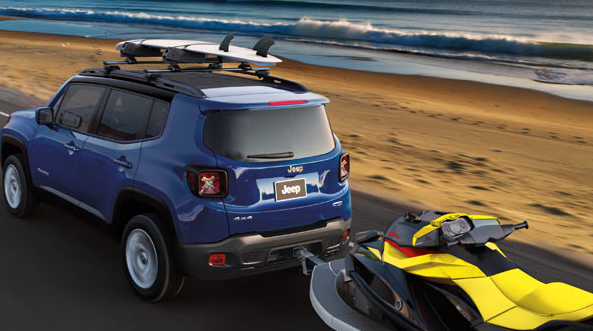 The Class-Exclusive Factory Tow Package gives the Renegade a towing capacity of up to 907 kg (2,000 lb). It is available on models with the 2.4L TigersharkTM MultiAir® I-4 and 4x4. A Class III receiver hitch with a 4-pin wiring harness is included. 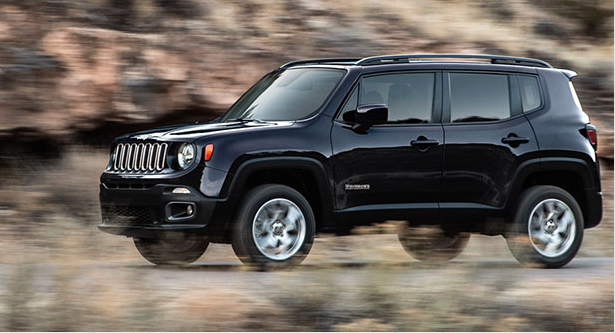 The Renegade offers 2 full-time 4x4 systems: Jeep® Active Drive and Jeep Active Drive Low with 20:1 crawl ratio. Both systems feature a Class-Exclusive rear axle disconnect that only powers the front wheels until 4x4 traction is needed to improve overall fuel economy. 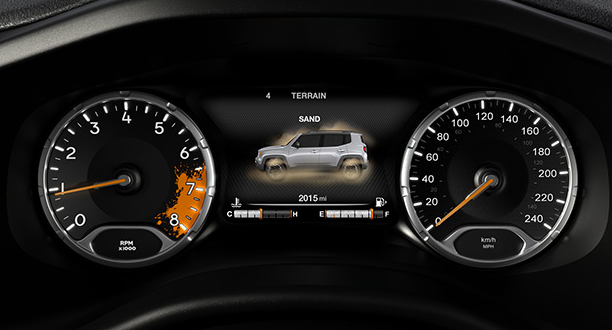 Selec-Terrain® Traction Management System is included with both and provides modes for Auto, Snow, Sand and Mud – plus Rock on the Trailhawk® – for superior traction in any situation. 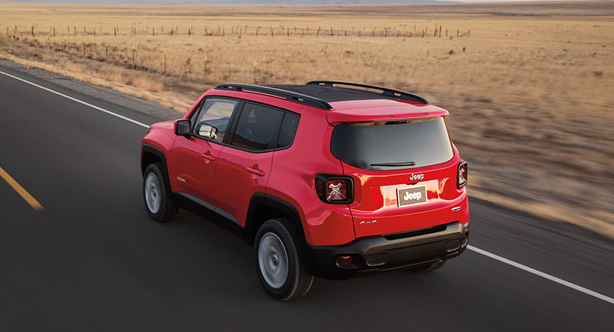 The Renegade matches its legendary capability with impressive on-road performance. This is achieved with a MacPherson strut front and independent rear suspensions for excellent ride and handling on all surfaces. 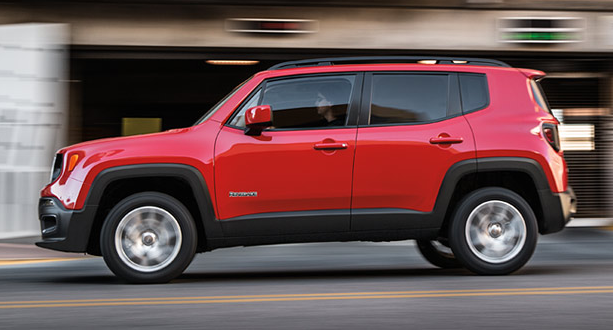 A stiff chassis also contributes to the Renegade's refined handling, while sound-deadening applications like acoustic glass and triple door seal system make it one of the quietest SUVs in its class. This available feature provides a full-colour display that keeps you up to date on important vehicle data like fuel economy, temperatures and tire pressures. 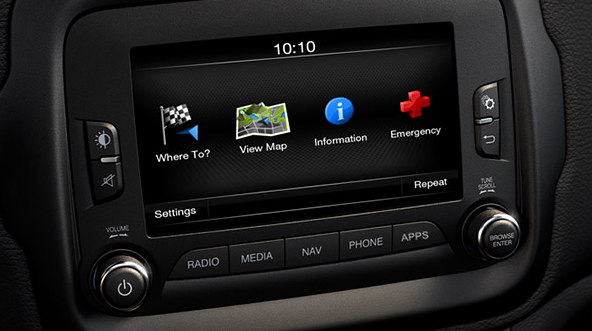 It also keeps you connected to information from available systems like the Selec-Terrain® mode and park assist details. The available Uconnect® multimedia centres give you control of your entertainment and vehicle systems. Uconnect 5.0 features a full-colour 5-inch touchscreen, hands-free communication with Bluetooth® streaming audio for voice control of your smartphone and entertainment, as well as USB and auxiliary inputs. Uconnect 6.5 NAV adds a larger 6.5-inch touchscreen, SiriusXM satellite radio with one-year subscription and premium navigation with 3D landmarks and terrain maps. The available 9-speaker premium audio system gives you exceptional sound quality with a 506-watt, 8-channel amplifier, two 3.5-inch speakers in the instrument panel, a 6x9 in each of the four doors, two additional 1-inch speakers in the rear doors, and a 6.5-inch subwoofer. 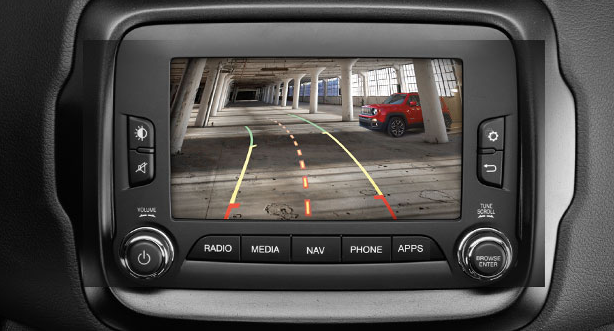 Make parking simple and efficient with the available ParkView® Rear Back-Up Camera. A high-resolution image of what's behind you is displayed on the touchscreen and dynamic grid lines help you steer safely into position. This available system can detect when you're approaching a vehicle or obstacle at an unsafe speed. If the front-mounted sensors detect a potential collision, they send an audible and visual warning, and pre-fill the brakes to prepare for emergency driver intervention. If the driver doesn’t respond, the system briefly engages the brakes to alert the driver. If the driver still fails to respond, a 1.5-second brake deployment is used to attempt to alert the driver again. Advanced Brake Assist will also kick in if the driver is not braking aggressively enough. Blind-Spot Monitoring continually scans the rear blind zones on either side of the vehicle via radar. If a vehicle is sensed, the driver is notified via an icon in the sideview mirror. Rear Cross-Path Detection monitors for vehicles and objects in perpendicular relationships to the vehicle when reversing. 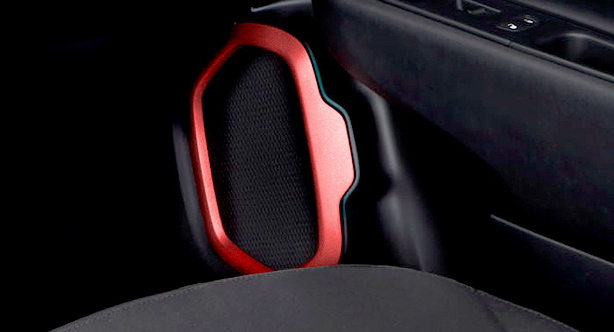 When it detects a potential hazard, it alerts the driver with an audible chime and/or visual icons. 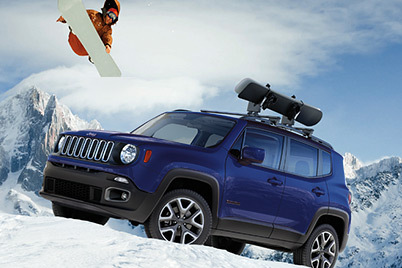 The Jeep® Renegade eliminates the traditional foot and handbrakes with this innovative system. 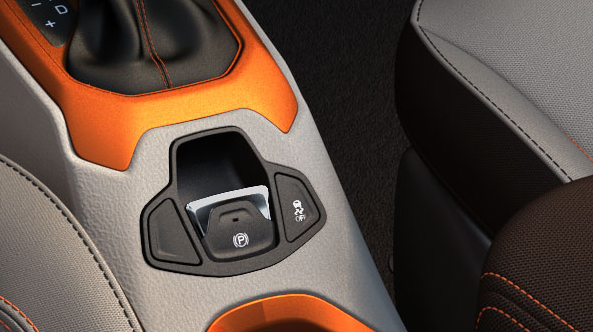 Simply pull a switch to engage and disengage the parking brake. It's that easy. You can also set it to release automatically as you drive away with your seatbelt buckled. Other features include the ability to program it to engage automatically, and Safe Hold, which can help apply the parking brake if you happen to exit the vehicle while still in gear. 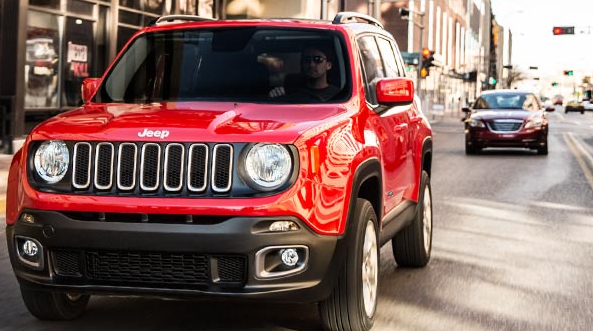 Take a look at the Jeep Renegade today!